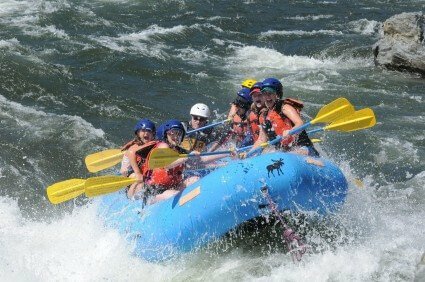 What do River Rafting trips with Rock-N-Water Christian Camps include? South Fork American River rafting trips including The Splash About river rafting trips and The Yakity-Yak kayak trips include all transportation once you get to our camp. Middle Fork American River white water rafting on our Ruck-A-Chuck rafting trips require for you to provide your own transportation from our base camp to the take out location – we’ll get you from the end to the start. Winter and Spring Conditions, weather, and snowmelt from October through early June can vary greatly in California. For river rafting trips that take place October through June there is an extra $15 per person fee in these months. What's it cover? In those months your trip will include free rentals of farmer-john wetsuits, booties, and splash jackets. Uncertain weather conditions in those months also means that when booking a rafting trip during these months, you should be aware that, while still low, there is a greater probability of river and weather conditions combining to create situations where we might cancel a trip, or need to substitute a different adventure in its place. Of course, if we cancel a trip you will receive a full refund, and if we substitute an adventure you will receive a refund for the price difference if we substitute a less expensive trip. From late June through mid to late August, California rivers are significantly more crowded on the weekends than the weekdays. They sometimes look more like a Los Angeles traffic jam than a natural river. Weekday rafting trips will not only cost you less, but also provide you with a more relaxing, isolated, and higher quality experience. The prices listed on this site contain all relevant fees, rentals, and taxes. There are no hidden costs. 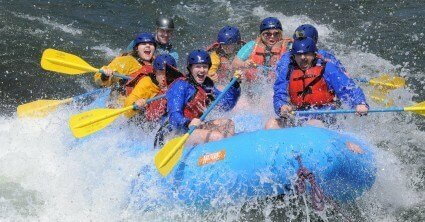 We can often accommodate groups of less than 6 people, but on some dates we might need to require you bring a minimum of 6 people for multi-day Class III California whitewater rafting trips, and a minimum of 10 people for trips that include a day of IV rafting, or III kayaking. The minimum number of people that you sign up for is used to determine your non-refundable deposit amounts. For rafting trips booked at least a month in advance, you will have 2 weeks to pay a non-refundable deposit of just 25% (based on the minimum number of people you plan to bring) is all that is required to hold your whitewater reservation. If you are booking your river trip at least 3 months in advance, we’ll spread that payment out into two payments over two months to make things easier for you. For trips booked less than 30 days out, full payment will be due shortly after booking your whitewater trip. If you signed up for a range of people, two Fridays before your trip you will tell us the final number of people that you plan to bring. Two Fridays before your trip is also the date at which you will be responsible for paying for the number of people you have reported to us even if someone cancels out last minute. 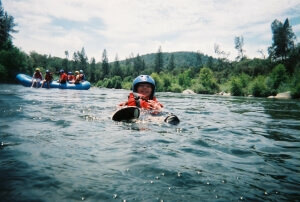 We are used to playing in the outdoors under a wide variety of weather conditions in California, so rafting trips typically happen rain or shine. We will contact you should we need to cancel your river trip in advance for any reason. In the infrequent event that Rock-N-Water cancels a trip, you will of course receive a full refund. Unique circumstances are a part of the complexity of daily life. While we can not promise to give you grace on your deposit or final payment, we can promise you that should you need to cancel or bring less people, we will individually evaluate your unique circumstances to determine if exceptions can be made.